In the tropical Island of Singapore there are no seasons expect summer.. And still, we do see some signs of autumn: the morning thunderstorms, the Halloween gadgets filling up the stores and the good apples and pumpkins imported from Europe, Australia or New Zealand. And what do you do with good apples? Apple pie!! 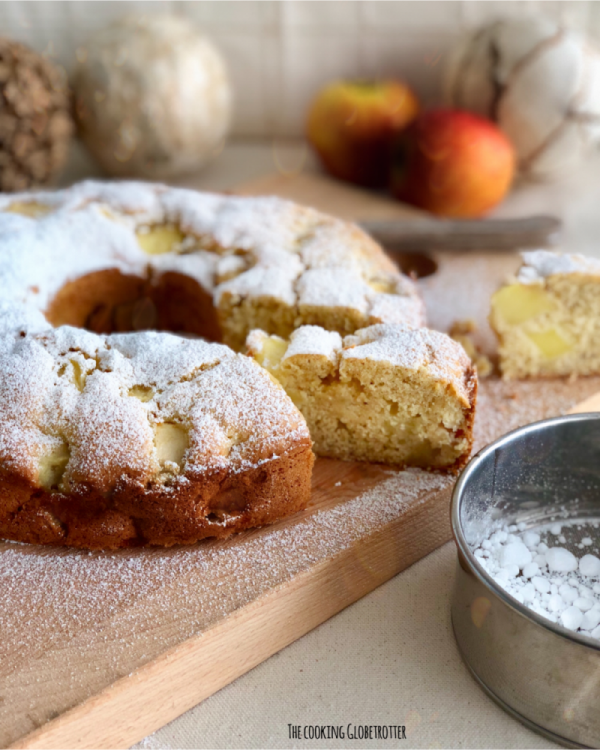 The first time I made this recipe, I was sure it was going to turn out into a disaster because there were tons of apples but almost no dough… I was soooo wrong!! The cake turned out to be moist and delicious! And it is one of those cases where you throw everything in the mixing bowl and then in the baking tin and in the oven and it’s done! No effort. Great results! Just my kind of recipe! 1. Preheat the oven at 200 degrees (180 if you are using fan). 2. Put the flour (270g), grounded almonds (30g), melted butter (100g), 3 eggs, sugar (125g), baking powder (16g), a pinch of cinnamon and a pinch of salt in a big bowl (or in your kitchen aid) and mix well together (with the flat beater). 3. Wash and peel the apples and cut them in approximately 1 cm pieces and add them straight away to the dough. If you are quick you do not need to add lemon to prevent them from going black. Mix well with a spatula now, don’t use the machine or it will break the apples. If you want to decorate your pie, keep one of the 4 apples aside for that. 4. Spray the baking tin with non-stick spray (it will be easier to release the cake, but it is not necessary). I like to use a round tin with a hole in the middle, but you can also take the square or round ones. 5. Pour the dough in the tin and spread it out evenly pressing it down a bit. 6. Optional: decorate with the leftover apple if you wish to, for example by cutting small slices and putting them in circles like roses. 7. Bake for 25-30 minutes or until golden brown and the sides detach from the tin. 8. Let it cool down 10-15 minutes before releasing it from the baking tin. 9. Let it cool down further ideally on a rack before sprinkling with icing sugar. 10. Serve with whipped cream for a fancy dessert! Looking for muffins instead? The check out my mini bundt cakes with grated apples and almonds! Preheat the oven at 200 degrees (180 if you are using fan). Put the flour (270g), grounded almonds (30g), melted butter (100g), 3 eggs, sugar (125g), baking powder (16g), a pinch of cinnamon and a pinch of salt in a big bowl (or in your kitchen aid) and mix well together (with the flat beater). Wash and peel the apples and cut them in approximately 1 cm pieces and add them straight away to the dough. If you are quick you do not need to add lemon to prevent them from going black. Mix well with a spatula now, don't use the machine or it will break the apples. If you want to decorate your pie, keep one of the 4 apples aside for that. Spray the baking tin with non-stick spray (it will be easier to release the cake, but it is not necessary). I like to use a round tin with a hole in the middle, but you can also take the square or round ones. Pour the dough in the tin and spread it out evenly pressing it down a bit. Optional: decorate with the leftover apple if you wish to, for example by cutting small slices and putting them in circles like roses. Bake for 25-30 minutes or until golden brown and the sides detach from the tin. Let it cool down 10-15 minutes before releasing it from the baking tin. Let it cool down further ideally on a rack before sprinkling with icing sugar. Serve with whipped cream for a fancy dessert!